The epigenome is like a set of switches that influence gene expression. Factors known to affect the epigenome include chemical and physical environmental stressors, diet, and life habits. 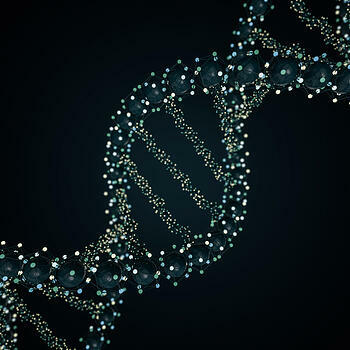 DNA methylation is one of several epigenetic mechanisms that cells use to control gene expression. It is a process where methyl groups are added to the DNA molecule, possibly modifying the function of the genes by turning them on or off. For this study, the researchers compared samples of subcutaneous adipose tissue, skeletal muscle samples, and blood samples from 15 healthy young males after one night of normal sleep (8.5 hours-long sleep opportunity) and one night of sleep deprivation (overnight wakefulness). All meals were identical between sessions, and low in sugar and fat. Using samples of skeletal muscle and adipose tissue, they were able to gain further understanding into how sleep loss affects key metabolic tissues. For example, in sleep loss, the glycolytic pathway in skeletal muscle is down-regulated leading to decreased glucose utilization and increased muscle protein breakdown. On the other hand, this pathway is up-regulated in subcutaneous adipose tissue leading to increased glucose utilization and triglyceride synthesis without adequate sleep. Adipose tissue experienced increased levels of proteins associated with adipogenesis during sleep loss, while skeletal muscle was found in a catabolic state. These observations are in line with previous findings of altered body composition associated with sleep loss. The researchers suggest that these tissue-specific differences may indicate that sleep loss actually reprograms DNA methylation (altering “metabolic memory”) in adipose tissue increasing the susceptibility to adverse weight gain. The contribution of sleep loss to DNA methylation, which promotes increased adiposity, may be the link that explains how chronic sleep issues and disruptions of natural circadian rhythm can influence the risk of obesity and other metabolic dysfunctions. The results confirmed previous findings that sleep loss favors the retention of adipose tissue over skeletal muscle mass. While there were tissue-specific differences in fuel utilization, researchers also found increased inflammation across tissues following sleep deprivation. Given what we know about the effects of sleep disturbance on weight loss, it is imperative that sleep interventions are combined with dietary and lifestyle measures to improve conditions such as obesity and diabetes. Small steps to increase the duration (and quality) of sleep include scheduling enough time for sleep, avoiding blue light several hours prior to bedtime, and avoiding stimulants such as nicotine, caffeine and alcohol in the evening.